The Emerald Isle was once a welcoming place, full of fun, peace and tranquillity. However, it was torn apart after years of clan fighting which had left Ireland in complete turmoil. The Murphys, residents of the once beautiful land were in search of a new home, to escape all of the hurt and bad memories. Little did they know their new home, Ishan, was not a welcoming place. 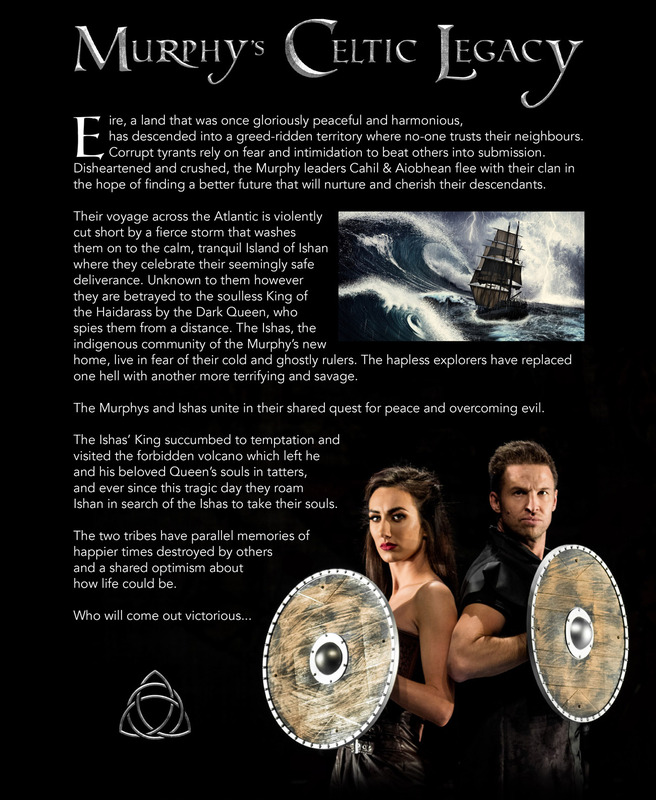 Murphy’s Legacy is a dark yet inspiring tale of courageousness and loss. How far would you go, to save the ones you love? What would you sacrifice, in order to finally achieve peace? These are tough questions that nobody ever wants to face, but when examined, make for extraordinary viewing. Despite its origins, Murphy’s Legacy spiritually lies in the North East of England. Show creator Chris Hannon, a former male lead in ‘Lord of The Dance’ and co-owner of the internationally recognised North East based ‘Hannon Murphy School of Irish Dancing’, joins forces with the best Irish Dancers from around the globe to bring you what is sure to be a new Irish Dance global phenomenon. Don’t blink, for this is no ordinary Irish Dance performance, it is a battle of styles, a clash of colours. Murphy’s strong cast give an invigorating performance of traditional Irish Dance, with dark cinematic undertones, creating a show like no other. After spending 14 years in the world renowned ‘Lord of the Dance’ show, Chris always had the desire to produce and choreograph a show himself. His biggest inspiration for this, and the name behind Murphy’s Legacy, comes from Chris’s grandmother Patricia Livingstone Murphy, who not only taught Chris to dance as a young boy, but also put Irish Dancing firmly on the map in the North East of England. Music and dance were a huge part of Patricia’s life and her talent was passed down to her daughter Kathleen, and together they have built up one of the most successful dance schools in the region - the ‘Hannon Murphy School of Irish Dancing’. Immersed in this dance background, and lucky enough to work with such a wonderful mix of teachers and fellow dancers, Chris’s dream of producing and choreographing a new Irish Dance show flourished. Producing four pilot shows throughout 2013, Chris knew that the time was finally right to take the production to the next level. A chance meeting with with John Elliott, an international artist and musical composer, John set about composing the epic sound track for the show using inspiration from Gerry Conlon's original music pieces and of course some much loved traditional Irish Music and then fused his own amazing original tracks, the project came together with full momentum. With new musical compositions from Loft, world-class dance choreography from a hybrid of UK and Irish origins, the heart and desire from Chris, not to mention the professional cast of internationally prestigious dancers and musicians, Murphy’s Legacy blew the roof off its World Premier at the Sage Gateshead on the 31st January 2015. 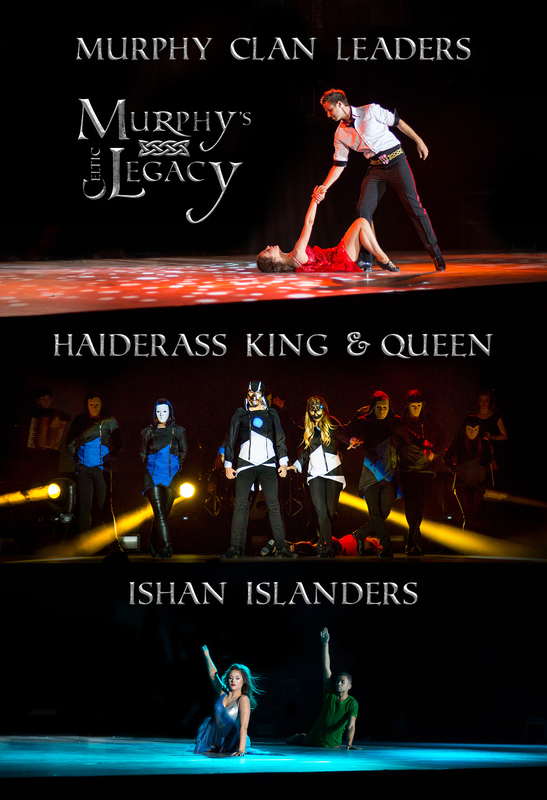 From there the show went onto tour the Middle East, becoming the first ever Irish Dance Show to tour Oman and Qatar. Murphy's Celtic Legacy also performed in front of a packed stadium in Dubai. Chris and his incredible Lord of the Dance career was that of sheer hard work and determination. Battling through rounds of auditions and months of training he made the cut and began his touring life with Star Michael Flatley at the young age of 16. His hard work didn't stop there though and his determination to become a lead dancer was a tougher test again. Training intensely for years and never giving up despite all the knock backs, his rewards came at the age of 20 when he made his lead debut. Chris performed 'Don Dorcha' alongside Michael in both his Lord of the Dance show and Feet of Flames, a credit only held by four male dancers. Murphy's is making its mark on the world and in 2016 became a much loved resident aboard MSC Cruises, racking up a total of 20 cruises to date. 2017 seen the show tour Cyprus in sell out amphitheatres, whilst 2018 was the launch of our French adventure and Premiere. 2019 will see debut tours in Ireland, North America, Holland, France and return to Cyprus.